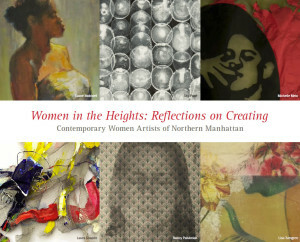 In celebration of Women’s History Month, NoMAA presents Women in the Heights – Reflections on Creating, an exhibition displaying works by 25 women artists residing in Washington Heights, Inwood, El Barrio and Harlem, curated by Andrea Arroyo. Gallery hours: Mon–Fri, 11 a.m. – 6 p.m., or by appointment (call +1 212 568-4396). The gallery will be open on Saturday 8 March, 11 a.m. – 2 p.m., coinciding with International Women’s Day. Opening reception: 5 March 2014, 6–8 p.m. Artist talk: 19 March, 6:30 p.m. Extended gallery hours until 9 p.m.
Artists: Margaret Day, Kathleen Granados, Antonia Guerrero, Risa Hirsch Ehrlich, Samantha Holmes, Varese Layzer, Michelle Melo, Elaine Mokhtefi, Michelle Orsi Gordon, Nancy Palubniak, Sky Pape, Nancy Rakoczy, Danielle Rocio, Katrin Roos, Sarah Rowe, Adesina Sanchez, Diana Schmertz, Uraline Septembre Hager, Laura Shapiro, Ashli Sisk, Renata Stein, Rachel Sydlowski, Lisa Turngren, Marianne van den Bergh and Sandra Vergara.